The gesture support in Mac OS X has been superb for many years. I recently had cause to set-up a new Mac and was confounded by the lack of three-finger drag support in the Track Pad settings. Three-finger drag on a track pad is my preferred setting. I eventually found the setting, tucked away in Accessibility under System Preferences. Upon activating Accessibility, scroll to the ‘Interacting’ group from the list on the left. 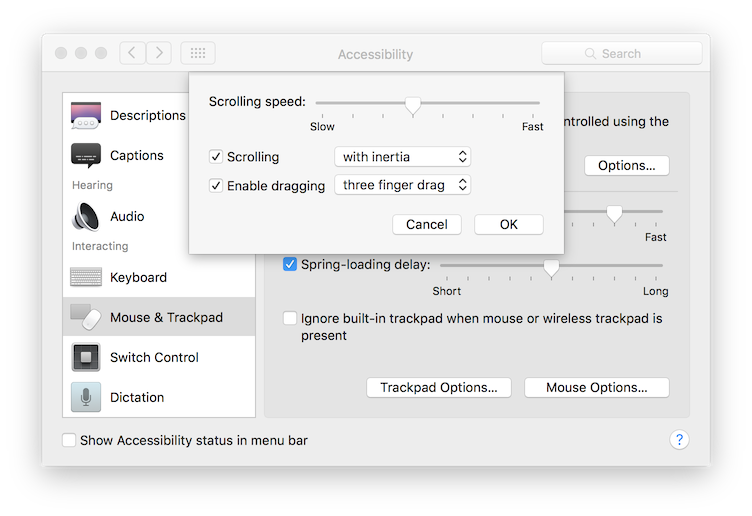 Select ‘Mouse & Trackpad’, click ‘Trackpad Options…’ and check ‘Enable dragging’. Lastly, select ‘three finger drag’ from the list. Settings/Accessibility houses the Mouse & Trackpad preferences pane. I can never figure out why these things have to change, but they do.